In this exclusive audio interview Emmy Winner Charlotte Robinson host of OUTTAKE VOICES™ talks with screen legend and LGBT Icon Tab Hunter about hosting with his partner Allan Glaser the Provincetown International Film Festival Launch Party Weekend that takes place June 3rd to June 5th in Provincetown, Massachusetts. Tab was selected as the Launch Weekend’s first-ever host in recognition of his status as a classic Hollywood film star and his local ties through his long-time collaborator and friend director John Waters who will also be attending. Waters is a founder of the Provincetown Film Society and the Provincetown International Film Festival. Opening Night schedule includes intimate meet and greets, special screenings of Hunter’s film the 1981 cult classic “Polyester” and the award-winning documentary “Tab Hunter Confidential”. There will also be the opportunity to hear from PIFF’s programmers about the upcoming festival lineup complete with insider tips, anecdotes, favorites and recommendations. We talked to Tab about his stellar career as he shared personal inspirational stories, lifelong survival philosophies and his spin on our LGBT issues. Tab Hunter has appeared in over 40 films. His breakout role in 1951 at age nineteen was with Samuel Goldwyn Studios in “The Lawless”. His Southern California “golden boy” good looks catapulted him to overnight matinee idol stardom and he enjoyed a robust film career throughout the 1950’s and 60’s. The 1970’s started out strong including a leading role in John Huston’s “The Life and Times of Judge Roy Bean” starring Paul Newman but work began to wane in the later 70’s. A call from filmmaker and fan John Waters catapulted Hunter back into the limelight and took him into a new, freer direction with the now cult classic comedy “Polyester” in 1981 starring the infamous drag icon Divine. 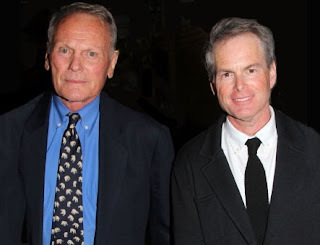 When his partner Allan Glaser saw Jeffrey Schwarz’s fabulous documentary “I am Divine” he hired Schwarz to do the brilliant documentary “Tab Hunter Confidential” recently release on iTunes and NETFLIX based on his bestselling autobiography. During the Provincetown International Film Festival Launch Party Weekend June 3rd to June 5th there will be must-attend festivities throughout including an intimate dinner with Tab Hunter and Allan Glaser, film screenings, parties and more. The 18th annual Provincetown International Film Festival runs June 15th to 19th. An absolutely charming interview and conversation.